Simply put, there are now far more people on the Medication Assisted Treatments methadone and buprenorphine (brand name Suboxone) than ever before, and more people are dying of overdoses than ever before. Yet treatment industry critics, reformers, and activists have been complaining for several years that the opioid addiction/overdose crisis is due to resistance to medications such as methadone and buprenorphine/suboxone. They claim that if the United States adopted Medication Assisted Treatments (MAT), we could end our opioid crisis, and stop the overdose epidemic. What they won’t tell you is that we have already adopted it, and it has failed miserably. In the years leading up to the FDA’s 2002 approval of buprenorphine the number of people on MAT (methadone was the available MAT at the time) for opioid addiction was only a fraction of the number of people with opioid addictions (in 2002 there were 1.7 million opioid addicts [counting both prescription opioids and heroin], and 215,000 MAT patients). The fatal overdose rate was low (0.69% annually as of 2002), and the probability of overcoming opioid addiction was high at 96%. Today, the number of opioid addicts and MAT patients is roughly equal (an estimated 2.1 million opioid addicts and 2 million MAT patients in 2016). And unfortunately, the latest data suggests that the probability of recovery has gone down, while the fatal overdose rate has soared to 2% annually. Most people think the overdose epidemic is caused by doctors overprescribing opioid pain relievers. This doesn’t fit the facts. There were 1.6 million prescription opioid addicts in 2002, and 1.7 million in 2016. Whereas the number of addicts taking opioid pain relievers has only grown by 100,000, the number taking two other opioids – methadone and buprenorphine, has grown tenfold from about 200,000 to 2 million in the same time period. Fatal overdoses have also grown from about 12,000 annually to 42,000 annually in the same period. 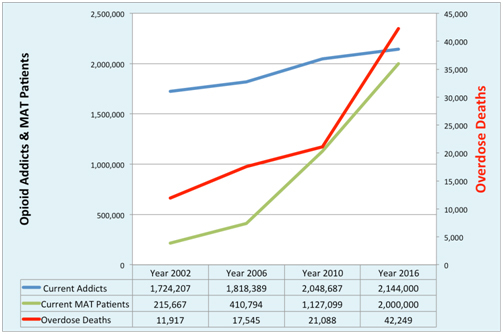 Long story short, the growth in opioid addicts cannot account for the increase in deaths, as it has been much slower than the rate of growth in both MAT use and overdose deaths. More people are using MAT, and more people are dying of overdoses. This demonstrates that MAT is probably not the cure to our opioid crisis. The popular narrative that resistance to MAT is a culprit in the overdose epidemic is a lot of hot air. Suboxone is not a magic bullet to end the overdose epidemic. We have tried it, and it has failed in the United States. There can certainly be individual cases where it may prevent overdoses, but on a whole, it hasn’t lessened the opioid crisis in the US, and the data suggests that MAT is contributing to the crisis. Full Report: Do Maintenance Medications Prevent Overdose? Maintenance medications for opioid use disorder (addiction) such as methadone or buprenorphine (brand name, Suboxone) are now widely recommended. These treatments are often broadly referred to as “effective treatments” or “the gold standard of treatment” for opioid use disorder. However, it is rarely claimed that these medications bring an end to opioid use disorder. Instead, a list of benefits is offered, usually in the following order: Maintenance medications (1) reduce fatal overdoses by half or more, (2) retain patients in treatment longer, and (3) reduce illicit opioid use. At the Baldwin Research Institute (hereafter referred to as BRI), we have analyzed the existing research, and will explain each claim in detail, starting with the claim that methadone or buprenorphine reduces fatal overdoses by half or more. This claim takes on special significance, because it is so often mentioned first as the main benefit of maintenance medications. What this common presentation suggests is that without maintenance medications an opioid addict is doomed to an early death, and thus must be on maintenance medications for the rest of his/her life. Quite simply put, the data does not support these impressions put upon the general public. Opioid overdose is still very rare whether an opioid addict is currently being treated with maintenance medications or not. This section of BRI’s series on opioid addiction will review the evidence on overdose risk reduction with maintenance meds, giving the reader a wider perspective on these claims. We will also analyze related issues, including the significance of overdose risk as a metric for treatment choices, and potential tradeoffs to be considered. There are two main studies that are usually cited to support the claim that maintenance medications (methadone or buprenorphine) reduce fatal overdoses by “half or more.” One was a large review of treatment records of more than 151,000 opioid addicts in the UK, along with death records for those who died during the observation period between 2005-2009 (Pierce, et. al., 2016). The other was a meta-analysis of 20 studies of smaller groups from around the world, conducted at various times between 1974 and 2015 (Sordo, et. al., 2017). The first (Pierce, et. al., 2016) generated evidence that the annual1 fatal overdose rate was 0.26% while being treated with maintenance medications (methadone or buprenorphine), and 0.53% while in treatment without medication. So it is true in this case to say that the risk of overdose was 50% lower in maintenance patients versus what it would’ve been had they only received counseling without medication. But on the other hand, it was a real risk reduction of only one quarter of 1% – from about a half of one percent (0.53%) to about a quarter of one percent (0.26%). This set of statistics are the main basis for the claim that maintenance medications cut the overdose rate by 50% of what it would be with other treatments. The second study (Sordo et. al., 2017) only included patients treated with maintenance medications. It generated evidence that among people treated with maintenance medications (methadone or buprenorphine), their risk of fatal overdose was multiple times higher when they discontinued treatment than it was when they were actively taking their medication. For methadone, the annual fatal overdose rate was 0.26% while on medication, and went up to 1.27% during periods when they stopped taking medication. So, overdose risk went up by 5 times when discontinuing methadone. For buprenorphine, it went from 0.14% on medication, to 0.46% when discontinuing medication –a tripling of overdose risk when buprenorphine patients discontinue the treatment. These numbers are the basis of the claim that those who take maintenance medications should stay on medication indefinitely. One opioid user’s risk, based on his personal pattern of behavior and consistency of his drug supply may be far higher than another’s. For example, Pierce showed that intravenous drug users had more than double the risk of non-injecting drug users (and non injectors had a lower all-cause mortality rate); those with an alcohol use problem had nearly double the risk; those with a benzodiazepine use problem had a risk elevated by about half; being in the 45-64 age group carried double the risk of the 18-34 age group; being female decreased risk by 30%. As above, even with these risk factors, the overall odds of fatal overdose were still below 1%, but the point in presenting them here is to demonstrate that not everyone is at the same risk. We personally know two heavy heroin users who acquired all their drugs from the same places, but one of them overdosed and had to be revived over a dozen times, while the other never overdosed once during the same time period. We don’t know for sure, but we’d venture to guess that the odds were a real, full 75% that the first one would die, due to his repeated trips to the emergency room and apparent unwillingness to take lower doses. Luckily he survived and eventually moved beyond his addiction. Each individual has their own risk profile, and while there is no surefire formula that can predict who will or will not suffer a fatal overdose, it is still an individual matter, best considered as an individual case, and discussed with a doctor who is knowledgeable about the individual’s history and the statistics cited above. Blanket statements recommending that all opioid users be on maintenance medications at all times are convenient for policymakers dealing with people as aggregates – but what applies to the group doesn’t necessarily apply to the individual. The tiny percentages of reduction in overdose rates provided by the medications might be outweighed by the long term adverse effects of keeping all addicts on medications and feeling trapped in a system they do not need or want. Methadone and buprenorphine are opioids, and thus they “bind” to the same receptors stimulated by heroin and other illicit opioids in the brain. When a drug is bound to a receptor, it makes it harder for other drugs to get through to that receptor. Maintenance medications have a stronger and longer lasting binding power than many other opioids. As long as they are bound to the receptor, they may cause some amount of other opioids taken to, in effect, bounce off of the receptors, thus preventing overdose. In more well known terms, maintenance medications allow the user to maintain a tolerance to opioids that makes it harder (but not impossible) to overdose. Buprenorphine has an important pharmacological difference from methadone that may make it more effective at preventing overdose. Methadone is a full agonist, which means that it can stimulate opioid receptors 100%, just like heroin and other opioids used for a high. Buprenorphine is a partial agonist, which means it can only stimulate opioid receptors about 50% of the way, which means it produces less of the physical symptoms that can result in overdose. This partial agonist feature, along with its strong binding power should theoretically protect against overdose better than methadone. We should note that the World Health Organization warns that it may not be advisable to use maintenance medications with patients who also have benzodiazepine or alcohol use disorders, as the risk of overdose increases. In this case, the tolerance provided by maintenance medications is less protective, because different depressants are being used, and stimulate the brain in different ways that may still add up to an overdose despite any protective effects of MAT. The opioid tolerance provided by maintenance medication is believed to be the main way they can prevent opioid overdose. An opioid user who detoxifies fully will lose his tolerance to opioids. If he then makes the rash decision to go back to immediately using the same dosages of opioids that he used when he had a high tolerance, there is much greater risk of overdose. In Pierce, the first 28 days following discharge from treatment had an elevated risk of fatal overdose: the overdose rate was almost 1% after discharge from maintenance, and double that (almost 2%) after discharge from residential treatment (but only 0.39% after discharge from outpatient counseling). This first month following treatment discharge was the period of highest risk in this study, after which the risk dropped. These are also the situations that policymakers hope to avoid by keeping people on maintenance medications indefinitely – if you never stop taking MAT, you will never have a first month off MAT. There can be no doubt that maintaining a tolerance with maintenance medications pharmacologically prevents some overdose deaths. However, the differences in overdose rates on and off maintenance medications may reflect other factors at play – behavioral differences. Consider also that “all cause mortality”, that is, deaths from both overdoses and other causes including diseases, accidents, suicides, et cetera, is also significantly lower while on maintenance medications (Sordo, et. al., 2017). What this could indicate is that in moments when people are sincere about quitting and taking better care of their health, many get into treatment and stay there. And of course, in moments when people are ready to start using heavily again, and thus take more risks with their health, they may choose to go off treatment. If this is the case, then being in treatment isn’t the cause of decreased mortality. Instead, being in treatment is an indicator of the fact that a person with an opioid use disorder is currently taking better care of their health – behaving differently. An analogy that may help to understand this is homeownership. Homeowners may be more stably employed, have higher incomes, higher net worth, and more savings than those who don’t own homes. But it doesn’t logically follow that homeownership necessarily causes these qualities – instead, it probably reflects them. The Sordo meta-analysis does not include data on opioid addicts using non-medication-based treatments or forms of help; nor does it offer results on populations who’ve used medications for detoxification only; nor does it offer results for those who’ve never received treatment. It only tells us what has happened in the lives of opioid addicts who’ve been on maintenance medication. Similarly, the Pierce study doesn’t do much better in covering the full ground. The vast majority of its sample was on maintenance medications; only a small minority used non-medication based treatments, and it included no tracking of untreated opioid users. We don’t raise these points to criticize the researchers, we raise them to say that there is still much that is unknown. What Happens without Any Treatment? Nicotine replacement therapy (NRT) is the most widespread form of chemical treatment for addiction. In clinical trials, NRT produces a slight but distinct advantage over people’s quitting cold turkey. But, as to maintaining abstinence, researchers at Harvard’s Center for Global Tobacco Control compared people who quit smoking either cold turkey, or with NRT, three times at interims of two years each (Alpert, et al., 2012). The study found no advantage in smoking cessation from using NRT. Moreover, for the most dependent smokers, NRT use significantly more often led to relapse. This typically happened when the smokers abandoned their NRT regimen, and then quickly relapsed. Dr. Gregory N. Connolly, director of Harvard’s Center and co-author of the study, regretted their discovery: “We were hoping for a very different story. I ran a treatment program for years, and we invested millions in treatment services.” (Carey, 2012). Peele chalks up the difference in success with a difference in mindset. Those who believe themselves to be powerless without a medication will be more prone to behave that way. Telling them they need a medication is teaching them this mindset. There is a similar result in classic heroin addiction research. The tens of thousands of American servicemen addicted to heroin in Vietnam in the 1970s were required to detoxify cold-turkey before returning home from the war. Over 90% received no treatment whatsoever, and even though half of them tried heroin again in the states, only 12% returned to using heroin within the first 3 years – 88% remained abstinent and moved on fully. This high rate of abstinence lasted, and 96% eventually became fully abstinent in a 24-year follow up of the sample. At the same time, those who received treatment for heroin addiction immediately upon return from Vietnam had a 67% relapse rate within their first 3 years home, a rate that was identical to that of other samples of treated heroin users at the time who hadn’t been to war (Slate, Scheeren, & Dunbar, 2017). The data from Pierce and Sordo must be viewed with these other results in mind. If all you know is the fate of opioid addicts who enter maintenance treatment, and some who enter non-maintenance treatment that teaches them the same ideas about having an incurable disease of addiction, then lifelong maintenance treatment appears to be the correct choice. But if you consider the potential alternatives, it may not be the correct choice, and the answer is not so cut and dry. Does the Reduction in Overdose Mortality Hold in the Current Time and Place? Pierce includes data from the UK in the years 2005-2009. Fentanyl hadn’t hit the heroin supply yet in either the US or UK at that time. In the UK, methadone has long been universally adopted as the go-to treatment for opioid addiction, and yet, as fentanyl hit the UK drug supply in recent years, their overdose rates climbed similar to the US’s. Likewise, Sordo’s data predates the entry of fentanyl into US black-market drug supplies. This leaves us questioning whether maintenance medications can truly pharmacologically prevent the fentanyl related overdoses currently plaguing the nation. Unfortunately, we do not have an answer to this question. By 2010, buprenorphine beat methadone hands down. Over 800,000 people were receiving it from physicians, while an additional 27,000 received it from treatment programs. The number of patients taking methadone increased to almost 300,000 – which is at a rate of growth far lower than that of buprenorphine. The point is this: maintenance medications have been widely adopted as the go-to treatment for all opioid addicts despite data showing that as use of it has increased so too have overdose rates. The number of people on methadone/buprenorphine grew tenfold from about 200,000 in 2002 to 2 million in 2016. Yet, overdose rates have more than doubled as a percentage of currently active addicts from about 7 tenths of a percent in 2002, to 1% in 2006, to 2% in 2010. We’ve already had the real life experiment with MAT, and it has failed in the US. Our preliminary investigation of existing research on reduced opioid use/sustained abstinence is disappointing. It appears that MAT doesn’t improve the rate of success over what would be achieved without MAT. Moreover, most MAT trials do not report rates of continuous abstinence; tend only to provide urinalysis results in the aggregate; and have high dropout rates. This is a complicated issue to explain, and thus will take a full report to do the issue justice. On the issue of retention, it appears that MAT does in fact retain people in treatment longer than other treatments. Treatment is a means to an end though – the end being the resolution of a drug use problem. If treatment doesn’t bring an end to a drug use problem, then there is no reason to consider retention as a metric for a successful treatment. But policymakers and families of troubled substance users have different ends in mind, due to differing conceptions of substance use problems and the people who have these problems. The families see a problem that can be solved and an individual with the potential to flourish; policymakers see hopeless lifelong addicts who must be managed to minimize damage to the rest of the society. This gap in views highlights a deep flaw in our society’s approach to substance use problems. Additionally, the appearance of a benefit to retention is likely an illusion. In the same way that 12-Step programs seem to work for a minority, but that minority is thus “retained” and continuously chooses to attend meetings – those “retained” in MAT may be those for whom it has “worked” and thus have chosen to stay on MAT. That is, like our homeownership analogy earlier, retention may reflect success rather than causing that success. This again, will take a full report to explain. This report is based on currently available data, and is an analysis of what has historically happened with MAT treatment here in the US and in cited studies from other countries. If new data becomes available or comes to our attention that changes the conclusions posited here, we will release an updated report. Report authors are Steven Slate, Mark Scheeren, Michelle Dunbar. ARCOS Drug Summary Reports. (n.d.) retrieved from https://www.deadiversion.usdoj.gov/arcos/retail_drug_summary/. National Institute on Drug Abuse. (2017, September.) Overdose Death Rate. retrieved from https://www.drugabuse.gov/related-topics/trends-statistics/overdose-death-rates. National Survey on Substance Abuse Treatment Services (N-SSATS). retrieved from https://wwwdasis.samhsa.gov/dasis2/nssats.htm. Slate, S., Scheeren, M. W., & Dunbar, M. L. (2017). The Freedom Model for Addictions: Escape the Treatment and Recovery Trap. BRI Publishing. Szalavitz, M., (2018, January 17). The Wrong Way to Treat Opioid Addiction. New York Times, p. A23 retrieved from https://www.nytimes.com/2018/01/17/opinion/treating-opioid-addiction.html. 1 The mortality rates in the referenced studies (Sordo et al 2017; Pierce et al 2016) were originally presented in terms of “per 1000 person years of observation.” We converted them to annual percentage rates as the 1000 person years format seems to obfuscate the significance of the statistics to the general reader. For example, a rate of 5.3 drug related poisonings per 1000 person years was converted to a 0.53% annual fatal overdose rate.